Can you believe summer is almost here (even though it’s rainy and miserable)? It’s time to start taking off the layers of clothing, and maybe some winter fluffiness. Your workouts are already covered at CFA, so now it’s time to dial in the nutrition component. The idea of food prepping has a tendency to elicit hives and lots of excuses as to why there’s no time to do it. But in reality, weekly prepping really doesn’t take long to do as long, as there’s a plan in place. So without further ado, here’s your plan! Step 1. Get off social media (after you read this, of course!). Come up with a plan that works for YOU, not someone you follow. Step 2. Go to the grocery store and purchase healthy foods you like and will eat. Lean proteins: fish, chicken and turkey. Lots of veggies: fresh or frozen. Carb sources to fuel your workouts: sweet or white potatoes, rice, quinoa or oats. Nuts, avocados, and coconut or olive oil will give you the healthy fats you need to help keep workout soreness to a minimum. Fruit is your post-workout carb source. Eggs are always great, so grab those too! Step 3. Cook it. Just like the old Burger King slogan, have it your way: baked, grilled, seared or microwaved. Season the food to your liking with salt, pepper, herbs, fresh salsa or olive oil. If it doesn’t taste good, you won’t eat it. Step 4. Pack it all up in containers. If you’re on the go, it’s especially great to have your meals packed and waiting. And this keeps your portion control in check. A good rule of thumb for main meals is: one palm-sized protein serving for women, or two for men; one fist-sized vegetable serving for women, or two for men; one cupped-hand carbohydrate serving for women, or two for men; one thumb-sized healthy fat for women, or two for men. The first week or two will be trial and error, as you work out how much to purchase and prepare. Eventually, it will become second nature! 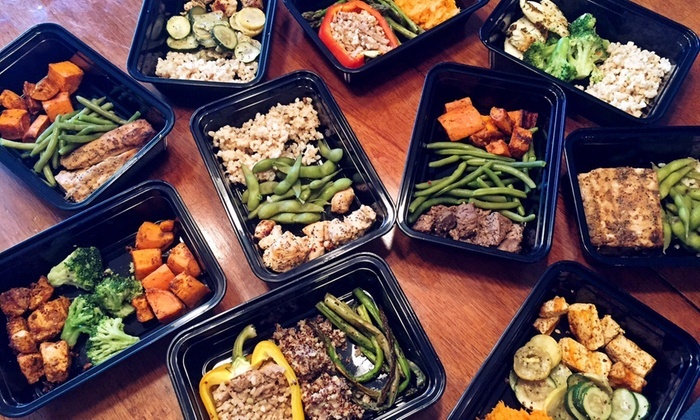 If you could use a little extra help, consider trying Meal Prep Grind. They offer both pre-measured meals and bulk food, already prepared and delivered to CFA weekly. As always, please feel free to reach out with any questions!